supports the health of teeth and gums. an effective dentifrice by virtue of its very astringent effect. natural ayurvedic formula with Neem helps cleanse deep toxins from the teeth and oral cavity. works effectively to strengthen teeth and gums and protect against tooth decay. 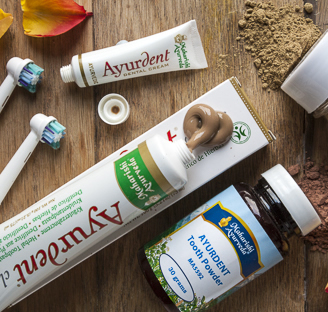 Ayurdent is a range of oral Hygiene products made from sophisticated blends of Ayurvedic herbs, which maintain healthy teeth and gums the natural way. They use the intelligence of nature to produce holistic oral health. Once or twice daily put some powder on a damp toothbrush and brush the teeth as normal. Leaving the toothpowder in the mouth for up to 5 minutes is beneficial. Then gargle with lukewarm water. Massaging the front of the gums with a little powder is also recommended. As bacterial imbalances within your mouth can travel down your digestive tract and affect your whole body, it is important that you look after the health of your teeth, gums and mouth. Almost all supermarkets toothpastes and mouthwashes are chemical-based and can create imbalances in the bacterial balance of your mouth and digestive tract, especially if they contain fluoride – a very harsh chemical. Our Holistic range of oral health products are completely natural, contain no fluoride or chemical additives, and include Ayurdent Toothpaste, Ayurdent Tooth Powder, Ayurdent Mouthwash and Tongue Scrapers. 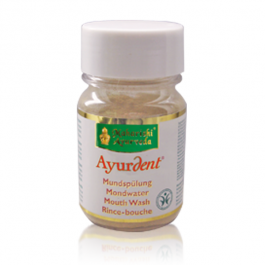 This Ayurvedic tooth powder corresponds to an ancient recipe recommended by Ayurveda for cleaning the teeth. Our Holistic range of oral health products are completely natural, contain no fluoride or chemical additives. 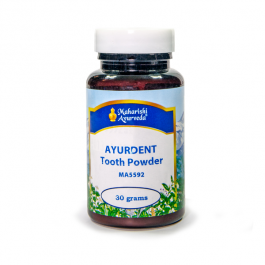 Ayurdent Tooth Powder is made from a sophisticated blend of Ayurvedic herbs, which maintain healthy teeth and gums the natural way. They use the intelligence of nature to produce holistic oral health. Once or twice daily put some powder on a damp toothbrush and brush the teeth as normal. Leaving the toothpowder in the mouth for up to 5 minutes is beneficial. Then gargle with lukewarm water. Massaging the front of the gums with a little powder is also recommended.